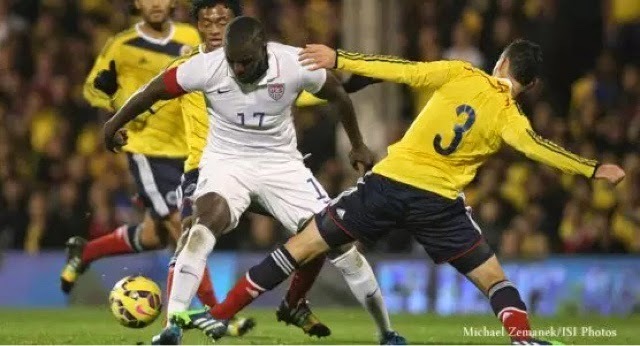 Team USA lost to newly-promoted powerhouse, Colombia, by a familiar score of 2-1. Why familiar? The U.S. played with strength and belief and new faces but a top team still steamrolled the USMNT for the majority of the game. The worst part about this loss was how it came. They lost it at the end of the game when they could have walked away with a galant tie. That part wasn't as much Colombian magic than the same game management problem that robbed the team of wins in October. It's true that friendlies are about careful observation and experimentation. Yet Klinsmann has shown time and again that he will experiment the day of the game. One thing that could have gone better for the team in Brazil was a sense of longevity and cohesiveness. That goes out the window with 6 substitutions. Let's face one thing. We can blame the October friendlies on the multitude of substitutions inthe second half, completely different teams won't play the same way. Against Colombia he turned to John Brooks and Jermaine Jones. While the latter always imposes himself in a match, the former was a head scratcher for sure. Colombia is Colombia. I haven't seen a team play so seamlessly since the Spain we all knew and loved from a few years back. So, in reality, the game was Colombia's to lose. And, truthfully, there should have been a penalty called in their favor also, which would make the 2-1 result a moot point. The game against Ireland is a more interesting game in that it is technically "winnable" if Klinsmann plays his cards right and sticks to a stout defense. Rubin needs to play, for sure, and maybe he can get his first goal. Altidore has the tools to dictate a match and will look to these friendlies to catapult him to a new team on January. Elsewhere for the team, Bedoya and Diskerud were impressive, as was Kyle Beckermann. Why he didn't play more in the latter games of the World Cup, we will never know. Fabian Johnson and DeAndre Yedlin might need to switch spots. Yedlin is becoming a speedy menace at midfield and is another gem for Klinsmann as we move forward into the regional tournaments and, eventually, to a place in Russia 2018.